It is done by a laser specially designed for this work. The high power laser energy thrown on the skin is absorbed by the tattoo pigment. The energy absorbed is enough to disintegrate the pigment. The pigment particles are slowly absorbed and destroyed by the body immune system. This process is slow and takes 6 to 8 weeks. One needs several sittings for total Tattoo removal. Permanent tattoos arent as permanent as they once used to be! Our advanced laser tattoo removal procedures effectively target the tattoo pigment to remove professional & permanent makeup tattoos. Q-switched nd:yag is the gold standard for treating tattoos as well as black pigmented spots. Results are best seen in fresh tattoos, black colored tattoos and superficial tattoos. Multiple sittings are required for best results. Birthmark, frackles & tattoo can be removed/reduced using a laser wavelength, which is specifically absorbed by the melanin and therefore acts mainly at the superficial skin level. Only the Q-switched emission is capable of treating dermal lesions efficaciously without running the risk of scarring. Tattoos have been a part of our tradition since ancient times. Tattoos can be ornamental, accidental or religious. Youngsters, now-a-days get tattoos done in a jiffy. Sooner or later, many of them regret their tattoos. Some feel “self-embarrassed or “permanently marked because of their tattoo. Having tattoos on our skin canvas has become a fashion of the modernisation. But, human nature lacks stability, which has compelled him to replace the old tattoos with the new ones. However, with the technological advancement, the tattoo removal procedure has become comparatively easier and safer. 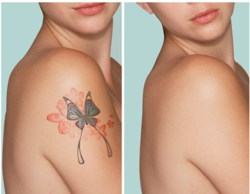 Slimsity is a well known clinic in Hyderabad offering laser treatment for tattoo removal. Laser tattoo removal treatment process is completed in 5-15 sessions based on the size, colors used, depth of tattoo and location etc. Each session takes just few seconds to a few minutes. We offer these services to the clients at a reasonable price range. A tattoo in disfavour is an unpleasant experience. Thankfully, removal of a tattoo is much easier and more effective than it used to be. Tattoo removal brings great relief in such circumstances of “Tattoo Regret. Clear Lift laser provides laser skin lightening, tattoo removal, pigmentation treatment, skin tightening, laser bleaching, post acne spots clearing & many more.